The Sakki-Sakki Tarot is the creation of Monicka Clio Sakki, an artist whose work is as lit up with color as it is in this deck. Color was the first thing that drew me to this deck, and it is part of the language of the deck. I also appreciated the quirky and whimsy illustrative approach to rendering the figures and background of the deck, particularly because it made it so much easier to read many of the figures as queer. The deck came packaged beautifully in custom-printed wrapping paper and box as colorful as the cards, which I must say I discarded immediately. This isn't anything against the box as it was, I just prefer tarot bags. The cards themselves are not as wide as most decks I have, which I love. The surface of the cards is matte, which is my preference, and helps me get past the thinness of the card stock. These will wear and fray with frequent use (as do so many other decks too!). I know this to be true. I'll get past it. I love a worn deck. For once, I won't even complain about borders. The borders are thin and blend so beautifully with the individual cards' color schemes that I hardly notice them. It feels like they complete the art (as opposed to containing it which is my beef with other decks, Mary-El Tarot I'm looking at you). According to the Monicka Sakki, the foundation of the deck's art is meant to incorporate traditional Rider-Waite-Smith symbolism with astrology and Kabbalic influences. I'm not a student of Kabbalah and I'm in many ways still a beginner in astrology so I won't speak as to their effectiveness here. I will say that for folks looking for an alternative to traditional Rider-Waite-Smith decks and their clones, the imagery here will be familiar without feeling rote or repetitive. Even in this unique style, it would have been easy to recognize all the cards even if their titles had been missing. As is becoming tradition with indie decks, there's a bonus major card: The Artist, meant to represent our creative journeys, a nod to the deck's mission "for the artist in each of us". Not much about the cards has changed too drastically, otherwise. The back of the cards are fully reversible (or if there's a difference I didn't see it) so for folks who work with reversals, you'll be glad. The suits are named Cups, Swords, Coins, and Rods (Rods being the only one I don't see too often anymore). The court cards haven't changed, you'll still have your Page, Knight, Queen, and King progression, though some of the figures are easy to read as queer (especially that Page of Swords, for me, who reminds me of a specific person I know). The deck comes with a little colorful book, and there's a larger companion book, Playing with Symbols, that is sold separately and is meant to provide deeper insight to the color theory behind the decks. It's not necessary, but if you have the means, it wouldn't hurt to know more about what the motivation behind the color choices were. Personally, I've enjoyed forming my own associations and letting intuition rule. There hasn't been a card that has particularly vexed me; it's easy to connect to these images. 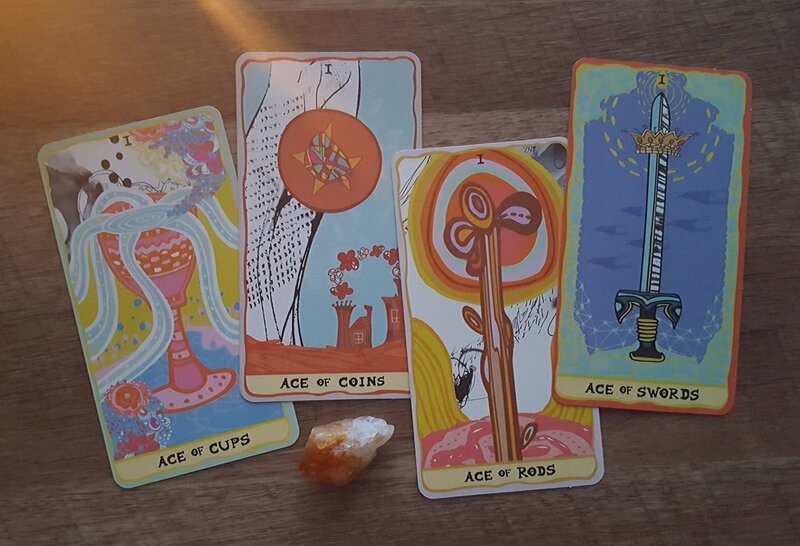 Which is why I would recommend this deck for beginners and experienced tarot readers alike, especially if you love whimsy art. You get your RWS foundation and a riot of color to go with it. What's not to love? If you're as charmed as I was, go ahead and grab yours at Monicka's website. You can also find the companion book and deck available as a package deal if you'd like to get deeper into the symbology and color theory invoked in the Sakki-Sakki Tarot.